Employers might not be clear on what happens after a female employee returns from her pregnancy/maternity leave of absence. Does the employee have to be reinstated to the exact position once she returns to work? Is it acceptable to place the employee in a different yet similar position? What if that position does not exist any longer? What if the employee must be terminated for other reasons not having to do with the pregnancy? 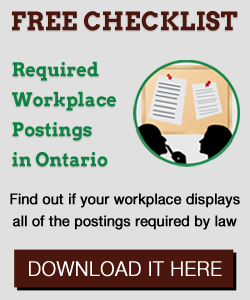 Provincial and territorial employment standards legislation across Canada is similar in this regard: once an employee has completed her leave of absence, the employer must reinstate her into the position she most recently held with the employer, if it still exists, or to a comparable position, if it does not exist. This includes paying the employee the same wage rate and benefits earned previously. The legislation does address the possibility of a job ending solely for reasons unrelated to the leave of absence: in this case, the requirement to offer an employee returning form maternity leave her former job does not apply. However, the employer should be able to show that the reasons had nothing to do with the leave. Similarly, the legislation addresses the situation where the employer’s operations are suspended or discontinued at the time that the leave ends: the employer must comply with the above rule as soon as operations are resumed. The big question is: what is a “comparable position”? After examining these factors, the board held that the job was comparable. The employee’s pre-pregnancy job involved working in a call centre as an “inbound campaign worker”, receiving telephone calls from customers who required further assistance with products. Contrastingly, her post-pregnancy job involved working as an “outbound campaign worker”, calling people and selling products to new customers, or new products to existing customers. When the employee returned to work, the inbound campaign she was working on had run its course, and future inbound campaigns had been outsourced to Pakistan. Only outbound campaigns were available for her. This work was comparable and the employer was permitted to provide her with the new job. I’m wondering: has your company ever been in a position where it was not clear whether a new job was “comparable”? Have you ever had to reinstate a returning employee into a position she did not like? there is a certain rule for that case.. and I agree in paying the employee the same wage rate and benefits earned after their pregnancy..